Nice, soft unique curtain, Pallette is perfect for the transition into Spring. Fast shipping. 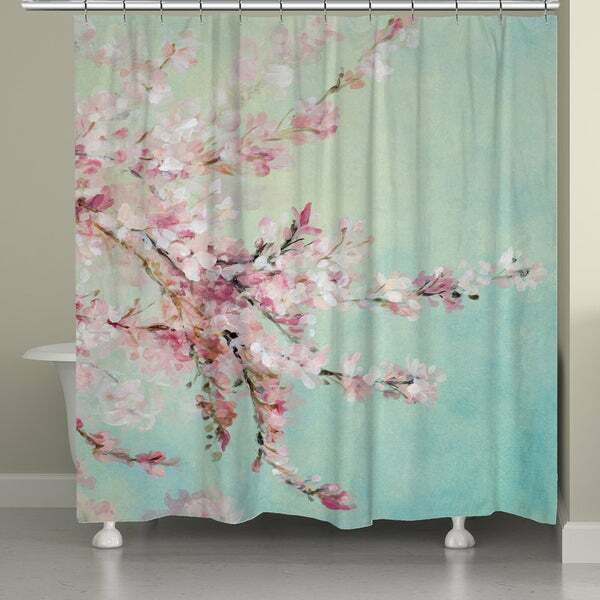 This floral design of cherry blossoms can brighten up any bathroom, bringing a touch of the outdoors inside. This product is digitally printed to create crisp, vibrant colors and images. Looks beautiful with all colors in al settings..get it! beautiful, excellent purchase, love it!! This is a very nice shower curtain but it has a lot of green in the background. I almost returned it because I was actually looking for a more lavender or purple shower curtain, and I thought that maybe the flowers had enough lavender to satisfy what I was looking for.....it didn't. This shower curtain is more pink and green. I kept mine but did not hang it. It's pretty, just not what I was looking for. I like to change shower curtains about twice a year so I've had countless shower curtains in my lifetime but I'm extremely happy with this one. The design, the color & the feel. I put it in the dryer for 10 minutes & the wrinkles were gone. I get a lot of compliments & while I do buy from other stores it seems I get the most compliments from items I buy from Overstock. Beautiful colors in this shower curtain. The ombre effect is striking. The material is not flimsy or cheap looking. The curtain really looks great in our bathroom. OMG I love this shower curtain. Made very well design is like a painting hanging in the shower. I have looked at so many shower curtains and find Overstock to have best selection hard to choose wanted so many! Returned it. Found it ugly in person. Great shower curtain! Adds a subtle pop of color while giving a relaxed vibe. It is also cloth which I prefer over plastic as it will last longer! Love this shower curtain. Very pretty. I love the colors! You can put so many combinations with it! "Is the bottom hemmed or can it be cleanly cut if needed"
"Shower curtain says blue and pink. I see like teal or turquoise blend. Is it the picture or me. It doesn't look blue. Actually looking at it again seems to have some green it to. Dee5 March 6, 2017"
It is an aqua blue and pink.